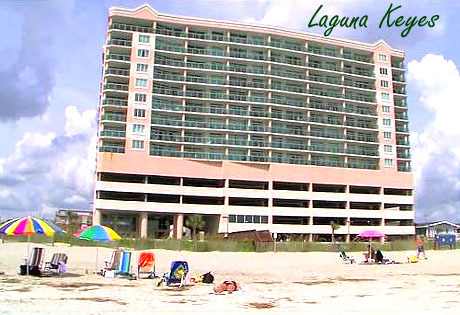 The new Laguna Keyes Resort, located in the Cherry Grove section of North Myrtle Beach, is arguably one of the finest resorts along the Carolina coastline. Extraordinary views, lush surroundings and privacy are yours when you stay at the Laguna Keyes Resort. This posh resort offers outstanding, modern architecture and a tropical resort atmosphere, as well as a superb location. Read more about Laguna Keyes real estate. Located on a pristine, quiet section of North Ocean Boulevard, away from the busy, major intersections, Laguna Keyes enjoys a close proximity to the Cherry Grove Peninsula, which therefore affords its guests beautiful, uninterrupted views of the ocean, as well as the salt marsh and bay. Other nearby sites include the Tidewater Golf Course and the Intercoastal Waterway. Laguna Keyes, which is 14 stories high, features just 97 condos and seven different floor plans, thus making it a truly peaceful retreat. One, two, three and four-bedroom oceanfront condominiums are available at Laguna Keys, with each one being beautifully decorated and appointed with the finest furnishings. Convenient amenities offered in each unit include a full kitchen with a dishwasher, a washing machine and clothes dryer, high-speed Internet access and several televisions, each with a VCR or DVD player. The awe-inspiring views offered from each unit’s private balcony are further enhanced with the aqua plexi-glass balcony banisters, thus making the sites truly spectacular! Resort-style conveniences are commonplace at this North Myrtle Beach condo, starting with the large, wooden sundeck which runs the width of the entire complex. Enjoy sunbathing or simply relaxing the day away at this private spot! 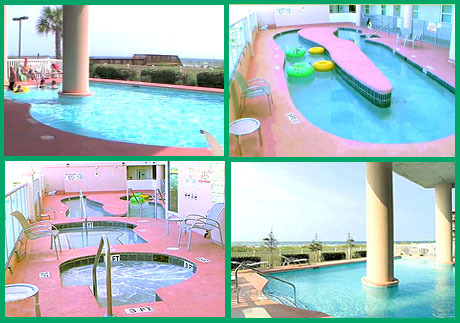 The oceanfront indoor/outdoor swimming pool is also a crowd pleaser, as is its innovative design. The sixth floor sundeck, which conveniently faces Ocean Boulevard, includes a lazy river that winds its way through lush, tropical trees, a whirlpool, a kiddie pool and a hot tub for relaxing after a long day of fun and sun. 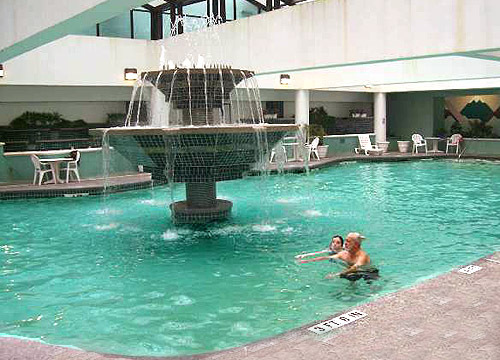 If the weather is dreary on any particular day, you can always head to the beautiful, indoor pool and fitness center, both of which boast stunning glass walls. The Laguna Keyes resort is also close to many, championship golf courses, waterfront shopping and superb dining, thus making the location a truly convenient one, regardless of your wants and needs.